описание (ru) FormsAPI Master программа, которая сравнивает две формы Oracle и даёт возможность объединить их. А также Forms API Master позволяет делать поиск по всем формам. description (en) FormsAPI Master helps you to programmatically modify and analyze Oracle Forms and Reports Modules. An easy to learn scripting language (similar to PL/SQL) gives you full access & flexibility over Oracle's Forms Open API. 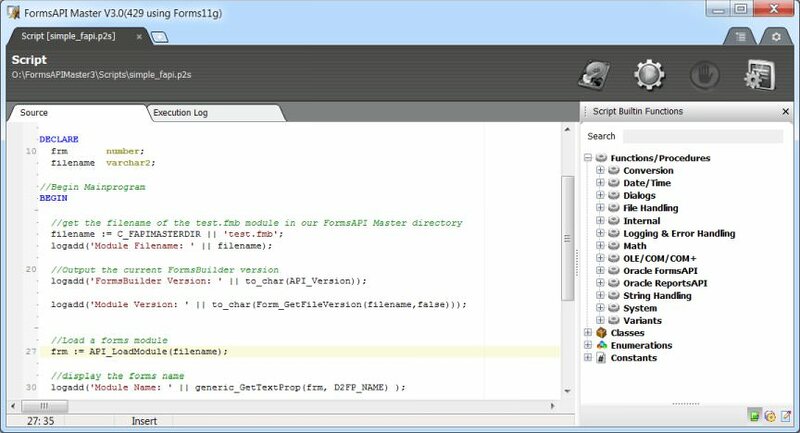 FormsAPI Master is a powerful add on tool for the Oracle Developer Suite that allows you to automate and track changes in Oracle Forms and Reports modules! The Oracle Forms Open API functions and procedures exposed through the scripting engine allow you to do everything (and more!) to a Forms module than what can be done by opening it up in Forms-Builder. You can create, change, and delete items and properties and apply and automate complex changes to large applications in minutes. The scripting language used has a PL/SQL like syntax that will make it very easy for Oracle developers to use the tool and get proficient in writing scripts on their own in virtually no time. FormsAPI Master crack comes with a large selection of tutorial scripts that will teach you all you need to know. The script engine has hundreds of small helper functions and classes exposed to it that make writing scripts a breeze. The built-ins will give you access to Oracle database connectivity, Excel functions, PL/SQL parser/tokenizer (for easier modification of program units and triggers) and many helpful string processing functions that will make it simple to get your work done. - Resize your old legacy 640*480 screens to 1024*768 or whatever resolution you like! - Make a visual make-over of your old design, Use a new color scheme, icons, add PJCs, and background graphics to give your application modern up to date look! - Translate labels, captions, titles, prompts, texts and list items of your Forms module into another languages and make it multilingual! - ...and many more ..